I would like to share a story with you. It’s a true story that I was blessed to find out about recently. A man was talking with his friend. He had been saved when he was young but fallen away from his faith many yeas ago. Under heavy conviction, he had a conversation with his friend about the things of God. His friend explained to him how far short we fall of God’s goodness and how we must put our whole trust in Christ alone to save us. The man said he didn’t know how to go about getting saved again at that point. His friend then explained that you can’t be re-saved; naturally and spiritually we have one birth, not multiple ones. He then explained that he needed to truly repent and pray for forgiveness. It was a few weeks later that the conversation happened that I initially referred to. The man thanked his friend from the bottom of his heart for explaining this truth to him. He said that he had been praying for years but for the wrong thing: He didn’t need to be saved but forgiven and once he asked for the right thing he instantly felt like “God wiped all the sin from my heart”. Thank God He’s still in the saving and forgiving business! 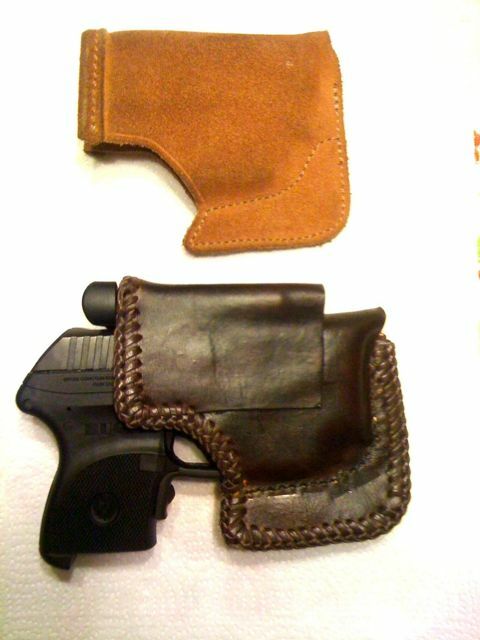 This is a pocket holster I made for my cousin’s Ruger LCP .380 auto. He had a Galco he bought (top in photo) but wanted one that would hold an extra clip. I made the custom one (bottom in photo) to accomadate that. It is made of 3-4 oz. veg tan, lined with felt. The stitching is double-needle saddle stitching. The lacing is 3/32 goatskin. I used contact cement to glue it together, giving it a little more body. It is dyed dark brown with Fiebing’s spirit dye. The top coat it TanKote.